The What: MediaVision has launched the TAIDEN HCS-5335 product series of gooseneck and boundary microphone options. The What Else: The solution is designed for portability, with no equipment rack pieces. The infrared transmitter and central processor are combined in one small tabletop unit that can be placed at the center of the table with a wide coverage radius of 26 feet. A PoE Dante-enabled solution allows for scalable installations with simplified wiring. Key conference management capabilities—audio settings adjustments, battery charge monitoring, microphone activation, and camera tracking—can be achieved through web control, from any browser-enabled device. As for all TAIDEN wireless solutions, the HCS-5335 series utilizes the company’s proprietary digital infrared audio processing and transmitting technology with a wide frequency response of 20Hz to 20kHz. They deliver high-fidelity audio while avoiding the pitfalls of RF technology with no need for frequency management, no pairing, no eavesdropping, no crosstalk, and the ability to install multiple systems in adjacent rooms. 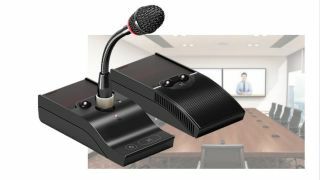 The Bottom Line: Smaller than the average smartphone, the new digital infrared wireless discussion system by TAIDEN presents low-profile microphone units in a compact package, meeting the need for clear audio in boardrooms and videoconference spaces.